In a city as large as Metrobay, it is surprising that there are so few good men residing within it. This wasn’t always the case; good men used to make up a large majority of the population, but they have since become the minority. Patrick Coleman is one of those few good men. He was an honest police officer for many years and watched the city he loved decay and rot before his eyes as criminal scum like Max Indeks rose to power and became almost untouchable by the law. Patrick vowed to make a difference. Sadly, his influence was severely limited by the corruption within his own organization, which was run by a corrupt and incompetent police chief who was also a member of R.O.P.E. Many of his fellow cops – even the good ones – became disheartened, indifferent, or worse yet succumbed to the depravity surrounding them on an everyday basis. Coleman’s battle was destined to continue and the winds of change brought about a quick and important turn of events. The newly elected Mayor Turner swept into City Hall with full intentions of cleaning up the town. One of the first things she did was to appoint Marcia Smith as warden of Metrobay Penitentiary and Patrick Coleman as the chief of police. Patrick has since made good use of his position, forming tight bonds with the Superheroine Squad, Action Cats, and other heroes of justice. This is partially to have some defense against likely retaliation from Max Indeks and R.O.P.E., but stemmed mostly from the realization that the police force alone was inadequate in dealing with the crime of the city. Patrick quickly recognized the superheroines as legitimate law enforcers, even helping found and fund the Grrl Power crimefighting branch to instruct and mentor promising young superheroines. His approach to discipline has served him well in cracking down on internal corruption and lazy work ethic. While corruption is still a widespread problem even within the police department, Chief Coleman’s efforts have vastly improved the department from the way it once was. He also understood that the war against crime was escalating into the world of high technology, and smartly hired a young technician named Marcy Smith to head up the department’s new crime lab. The chief was instrumental in arranging for the transfer of the experimental supercomputer Sentius to police custody, which was working well until Dr. Twisted got involved and changed the face of Metrobay forever. 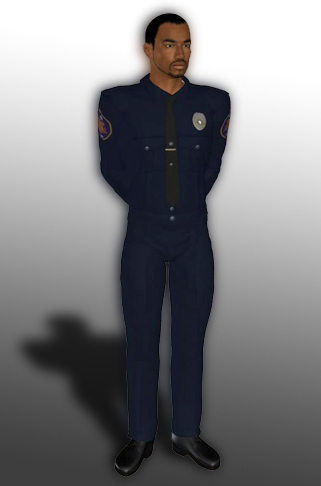 Chief Coleman is particularly good friends with Ms. Metrobay, who helped inspire him to become a police officer when he was young, and like most men in the city he harbors some secret attraction to her. He also has a very good relationship with Warden Smith, who was his partner, friend, and moral support early on in both of their careers. One of the cadets that was under his supervision, Crissy Tanner, recently began acting strangely, and upon switching bodies with the android MilkMaid, who bore Ms. Metrobay’s appearance, she successfully seduced her former superior officer under the guise of Ms. Metrobay, though upon discovering the sham he was hypnotized by MilkMaid’s hypnotic breasts and awoke with no recollection of their tryst.